In my eyes this approach leads to a broader understanding of the need to get spatial. What it lacks, is a haptic feed back ( to release a stroke, a button has to be pushed) and a threedimensional output. 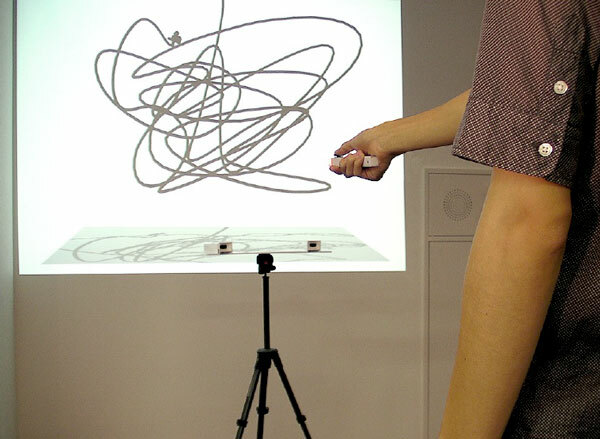 In his set up, the drawn strokes are projected on a 2D plane. A rotation of the strokes might give a better understanding of the spatial qualities. We will try to get him in front of the camera today, to ask him a few questions on these points. The presentation will be online by tonight! as a video, to show her instead is his nice way of making mobile phone sketching possible!